“It’s not because I tarry, it’s because I have mercy,” the male voice came from the Heaven and drowned the voice of wave. It was so powerful that the wave turned quiet. The globe that showed the map of Europe, Asia and America revealed in front of me. I had a bird’s eye view of the Earth. I saw the seventh angel showed up in the universe. (I’d ever seen in the vision that this angel triggered the 2008 financial crisis, the sandstorm in Kuwait in 2011, and earthquakes of South Asia in 2012 which includes the magnitude 8.7 earthquake in Sumatra, Iran earthquake and India earthquake.) His hands stroke the Ring of Fire, where was disturbed. 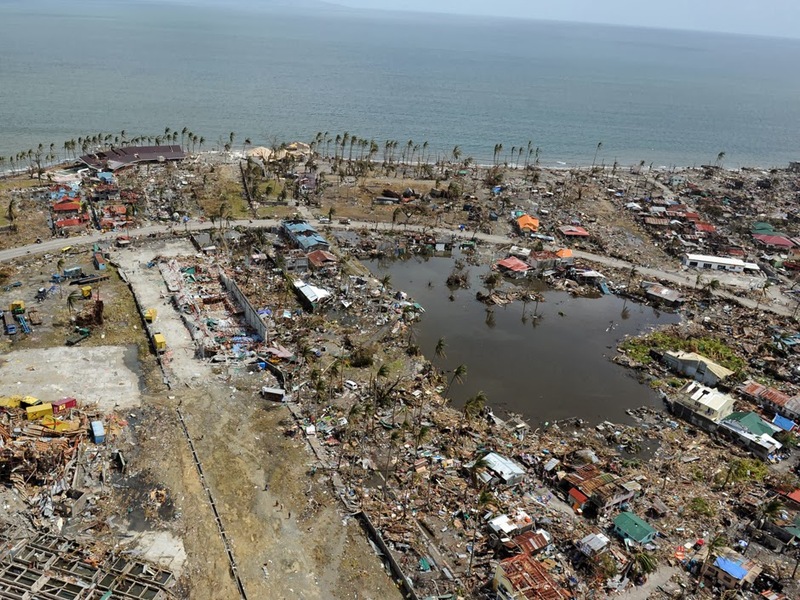 Huge typhoons and hurricanes made a landfall on the coastal area. One of the angel’s feet stepped on the map of Europe, the place near the Mediterranean, and the other foot stepped on the territory of USA. 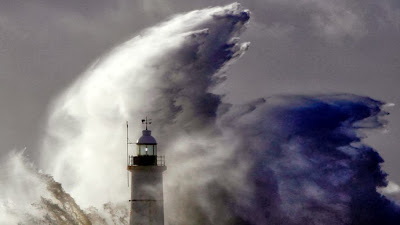 The seawater flew inland. I saw shops, cars and houses sink in water. The Prophecy Starts to Be Fulfilled!! Most of the deaths appear to have been caused by surging sea water strewn with debris that many described as similar to a tsunami, leveling houses and drowning hundreds of people in one of the worst natural disasters to hit the typhoon-prone Southeast Asian nation. 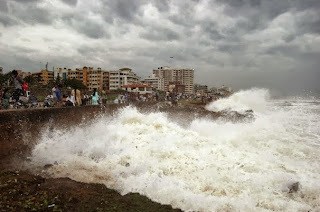 "Roads were all but empty as high waves lashed the coastline of Orissa state......Seawater pushed inland, swamping villages where many people survive as subsistence farmers in mud and thatch huts. In Behrampur, a town about 10 kilometers (7 miles) inland from where the eye of the storm hit, the sky blackened quickly around the time of landfall, with heavy winds and rains pelting the empty streets." 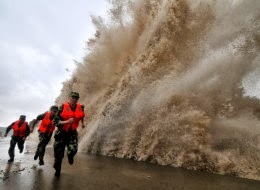 A typhoon has struck the south east of China killing at least five people and leaving severe flooding and a trail of destruction in its wake. More than half a million people had to be evacuated from their homes. Typhoon Fitow cut power across the region and flights and train services were suspended. In the town of Shuitou in Zhejiang province, close to Shangai, the main avenues were turned into rivers, with debris and parts of houses floating by. 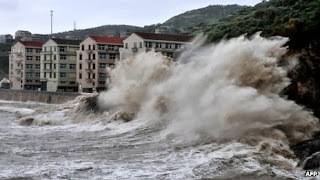 In Fuding city in neighbouring Fujian province, winds of up to 151 kilometres (94 miles) an hour tore through the area. There were reports of floods of up to four metres in depth in some low-lying towns.